I wish there was no need for Facebook posts about lost and found pets. It is sad and frustrating to see page after page of animals that have taken off during storms or been stolen or simply walked away from their homes. Fortunately with the enormous reach of social media more and more pets lives are saved and they are returned to their loving homes. But once I saw a picture recently on Facebook of the stray tri-colored Border Collie I couldn’t get my mind off him. I looked at my well fed, groomed and healthy dogs and felt guilty. Somewhere nearby a dog had purportedly been thrown out of a van with Alabama license plates and left to survive on his own. The area is a place of farms and woods, with streams winding through the country side. Narrow roads meander around the Florida/Alabama state line about thirty miles NNW of Pensacola, Florida. Yesterday I drove to the location at the intersection of highway 99 and 196 in Molino, never imagining I’d actually see him. There he was though, as if waiting for me. As I pulled up next to where he was sitting on the side of the road he walked up to my van. Did he think it was the van that had abandoned him? He sniffed around it and walked a bit behind the vehicle. I grabbed some dog treats, talked softly to him and called him to me. He growled and stepped further away. The Border Collie appears older, a tri color but his appearance since the photograph of April 18th has deteriorated. His coat is now ragged. He is thin and walks like his feet are sore. Nearby there is a house with a fenced yard. Two dogs stand next to the fence. The Border Collie seems to have befriended them. But he has learned not to trust humans. Returning home I entered his location on Facebook and the exact time I saw him. Others are also stopping by, trying to save him from starvation or from being run over. But the dog is afraid, perhaps never knowing the love that some humans can offer him. Today someone else will look for him and leave food. Tomorrow I’ll do the same, hoping that perhaps as he becomes weaker and tired that he will allow us to touch him, that he will give us a chance to restore his faith in humans. I have to accept that he may never allow himself to be captured, that he may run for months. But I’m hoping that someone will be able to put a collar around his neck, take him to the vet, possibly rehome him and give him the life he deserves. 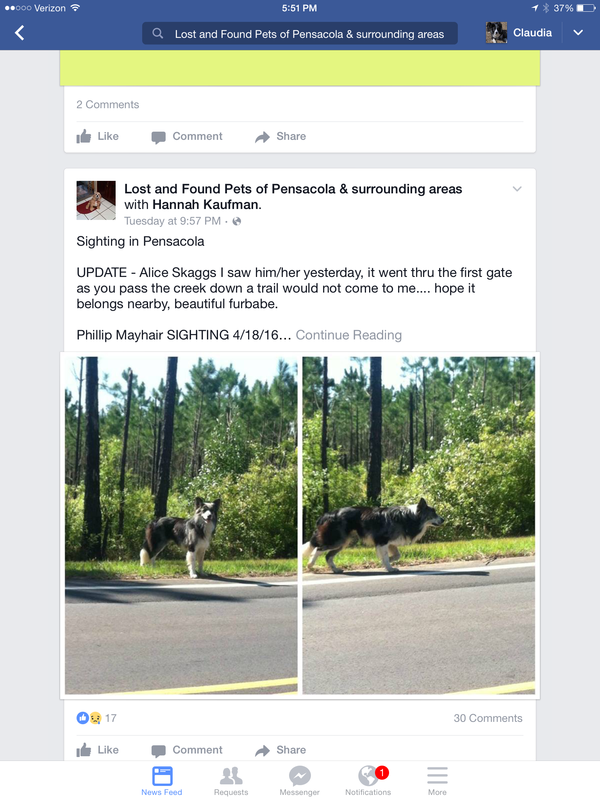 This entry was posted in border collies and tagged Border Collies, Lost and Found Dogs Alabama, Lost and Found Dogs Pensacola. Bookmark the permalink. Try to obtain a large trap that he can walk into and one that will trigger easily. Read all you can about trapping semi feral or feral dogs. It can done. I’ve done it before. I had someone build a trap for me. Please rescue that pretty dog. Good luck and prayers are being sent for you and the dog.